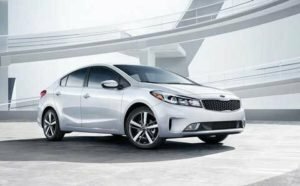 In this comparison of the 2017 Kia Forte and Ford Focus compact sedans, we’re describing the “basic” models of each: the Forte LX Manual and the Focus S Sedan. As always, when comparing features, it’s important to consider the cumulative effect of all the features, whether standard or premium. Imagine plush leather upholstery in an otherwise bare-bones interior – that wouldn’t seem very luxurious. When two vehicles come from different manufacturers, it can be even more difficult to decide which best suits your needs and tastes. With such a sizable investment as a new car, it’s important to give careful consideration to which options are important to you, so we’ve prepared this comparison to show you the standard features and options available on the Kia Forte and the Ford Focus. The 2017 Kia Forte is technically a compact sedan, but it doesn’t give that impression. Its smooth, stylish lines are nothing short of sleek, giving the car a slightly sporty appearance. Kia offers a total of 10 different paints, but only 6 of those are available on the Forte LX, 3 of which are metallic. The changes in the Forte’s body styling since the 2016 model are largely limited to subtle changes in the trim and the form of the front and rear body-color bumpers. Like the Kia Forte, the general form of the 2017 Focus changed very little over the 2016 model – even the trim packages are essentially the same. While the company offers a number of different body colors across the different Focus models, the Focus S is only available in 4 colors. Like the Forte, the Focus S bumpers are body-colored. The Focus isn’t an unattractive car, but it seems a bit less sleek, perhaps because it’s slightly wider than the Forte. Although both seat only 5 people, the interior of the Forte LX is roomier than that of the Focus S, both in the front seat and in the trunk. The workmanship and material quality of the Forte is excellent, as is the case with all of Kia’s cars. The Forte is also exceptionally quiet in the passenger compartment, particularly for a compact. The Forte offers a comfortable ride with more leg and head-room than the Focus and excellent safety provisions. Front and side air bags, rear head air bags and structural beams in the doors help protect the driver and passengers in the event of a mishap. While the Focus offers a few more features as standard than the Forte does, the options available for each keep them on relatively even footing. Although it’s slightly wider, the Focus is still slightly more cramped for interior space, so a very tall person may find its limited leg room a bit uncomfortable. The Focus also has slightly less trunk space than the Forte. The Focus is otherwise a comfortable ride, with a similar air bag configuration for driver and passenger protection. The doors also have integral structural intrusion beams to enhance safety in case of a crash. The Forte LX offers attractive trim finishes that combine well with the exterior finish, carpet, dashboard and the cloth upholstery. It features 15.0 in. steel wheels with full wheel covers. Bumpers and door handles are body color. The Focus S doesn’t come with a lot of trim options – body color bumpers and door handles and only a little chrome are standard fare. The Focus also features 15.0 in. steel wheels and full wheel covers. While other 2017 Forte models offer many of the same technology options available on the Optima sedan, the Forte LX is the basic model, with relatively few frills. Power windows and mirrors, auto-off headlights and remote keyless entry are standard, along with satellite radio. But cruise control, memory mirrors, power seat and rear parking aid are upgrade options. The Focus S standard features are very similar to those of the Forte, with the exception of cruise control and the satellite radio, which aren’t available, and many of the options offered for the Forte aren’t available on the Focus. Kia equips the Forte LX with a full array of air bags to protect the driver and passengers on all sides, as well as 3-point seatbelts front and rear. The Forte also comes with traction control, tire pressure monitoring system and brake assist, as well as having its doors reinforced with beams to protect against crumpling. Like most Kia models, the Forte LX also standardly features 4-wheel ABS and electronic stability control. Upgrade options include wireless cell hookup and back-up camera. The Focus compares well with the Forte in the safety category, adding the wireless cell hookup, hands-free communication and back-up camera to all the same standard features provided on the Forte. The Forte LX comes with standard cloth bucket seats with CleanTex protection. The driver’s seat is 6-way manually adjustable. The Focus S also includes cloth seats, 6-way manually adjustable for the driver. Bucket seats are available as an option. The front-wheel drive Forte LX standardly comes with a 2.0L (147HP) 4-cylinder, multi-point fuel injected engine, with continuously variable valve timing to optimize performance and exhaust emissions. It has a 6-speed manual transmission (6-speed automatic is also available) and sports 15” tires on steel wheels. 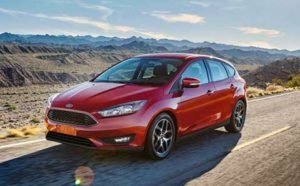 The Focus S is also front-wheel drive and comes standardly equipped with a 2.0L (159HP) 4-cylinder engine, with continuously variable valve timing, which improves both emissions and performance. It has a 5-speed manual transmission powering 15” tires on steel wheels. The front wheel drive Forte LX has a 6-speed manual transmission, which is both responsive and efficient. The Focus S, also front wheel drive, is driven by a 5-speed manual transmission. The Forte’s basic warranty covers 5 years or 60,000 miles, with a separate corrosion warranty providing coverage for 5 years or 100,000 miles. The drivetrain is covered for 10 years or 100,000 miles and roadside assistance is included for 5 years or 60,000 miles. The Focus carries basic warranty protection for 3 years or 36,000 miles, with corrosion protection for 5 years, unlimited mileage. The drivetrain is warranted for 5 years or 60,000 miles and roadside assistance covers 5 years or 60,000 miles. Before you make your decision, you owe it to yourself to check out both the Ford Focus S and the Kia Forte LX. 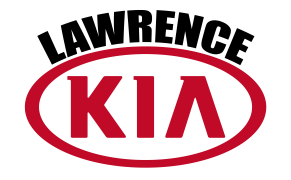 Browse Kia Forte Models and reach out to one of our sales representatives to schedule a test drive. When you’ve driven both, we’re sure you’ll agree the performance and comfort of the Forte make it the better choice.